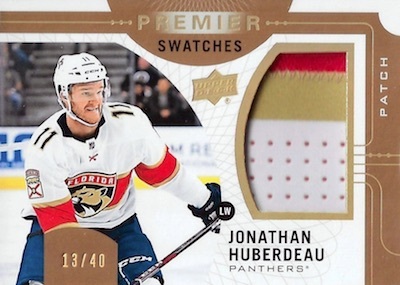 Maintaining the quality look and feel of the NHL brand, 2017-18 Upper Deck Premier Hockey largely sticks with what it does best. For collectors this means a premium, hit-based product. Another strong selling point is the 100% rate for on-card autographs. Wasting no time, fans of "The Great One" get a treat right off the bat with the added possibility of signed tins from the legendary Wayne Gretzky. Inside each metal tin, 2017-18 Upper Deck Premier Hockey packs five hits, just as it did in 2016-17. 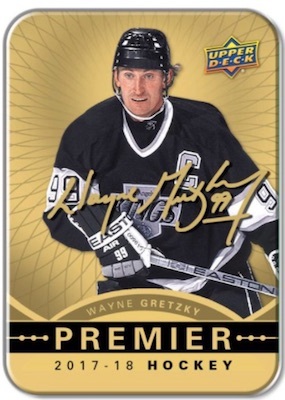 Coming two per box, the 2017-18 UD Premier base set consists of stars (#/249) and legends (#/149). The base set is joined by limited relic parallels. These include Base Jersey (1:2) and Legends Jersey (1:20), along with numbered Premium Materials, Neckline (#/6) and Tag (#/3) versions. In addition, the Platinum Blue Spectrum Autograph parallel has just five copies. 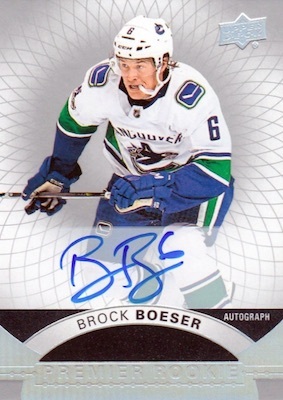 Adding to that, base rookie cards are numbered to 399 or 199. Memorabilia parallels here consist of Rookie Jersey (1:2), Rookie Patch (#/36), Rookie Neckline (#/12) and Rookie Tag (#/3). Signed choices are offered with Rookie Silver Spectrum Autograph (Tier 1 - 1:3; Tier 2 - 1:25) and Rookie Platinum Blue Spectrum Autograph (#/5). 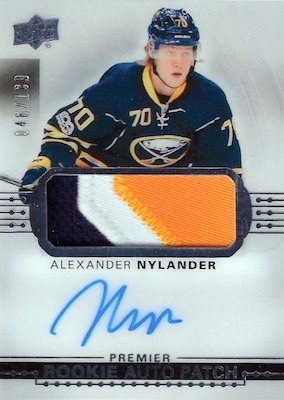 Continuing to focus on the first-year players, the 2017-18 Upper Deck Premier Hockey checklist features acetate Rookie Auto Patch cards numbered to 299 or 199. The Platinum Blue edition drops that number down to just 25 copies. 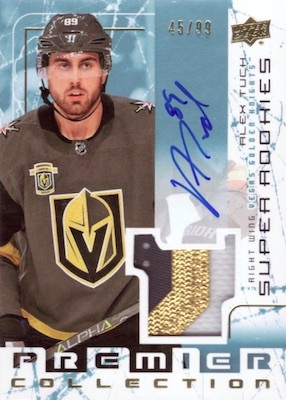 Celebrating a past design, the 2002-03 Rookie Auto Patch Tribute (#/49 or #/15) and 2003-04 Rookies Auto Patch Tribute (#/99) cards have Gold parallels numbered to 15 or five. 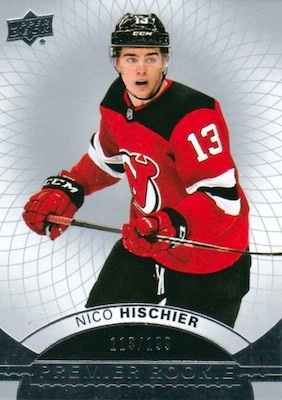 Each Rookie Auto Patch set has unsigned versions, as well, likely for Nico Hischier and Nolan Patrick. 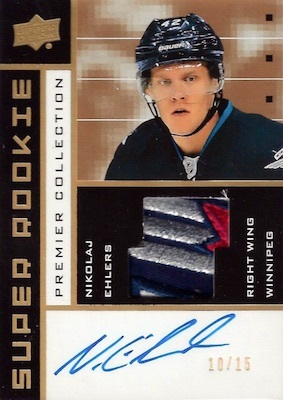 Similar to the rookies, established players also get the call in 2017-18 Upper Deck Premier Hockey with acetate Star Auto Patch (#/49 or #/25) cards and a Platinum Blue (#/5) parallel. Other signed inserts include Inked Script, Magnificent Marks (1:4), Signature Award Winners and Signature Champions. The massive Premier Signature Booklets (1:5) and Premier Dual Signature Booklets (#/40 or #/20) inserts really make a statement with oversized autographs from elite players. 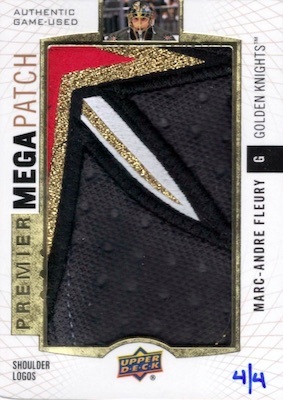 An umbrella set, of sorts, the Premier Mega Patch line in 2017-18 Upper Deck Premier Hockey is home to multiple hand-numbered memorabilia cards, including Commemorative Logos (#/3), Chest Logos, Shoulder Logos (#/3) and Sleeve Numbers (#/4). 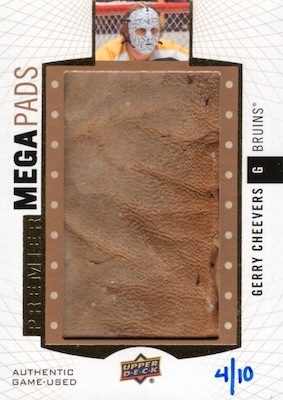 Mega Pads cards are new, featuring goalie relics and a print run of 10. The Mega Patch Duos and Mega Stick Duos sets are each numbered to 25. 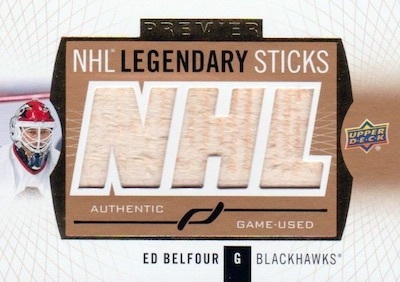 Another debut insert in 2017-18 Upper Deck Premier Hockey is NHL Legendary Sticks. These cards contain game-used stick pieces with a die-cut design. Of course, there are many other relic hits to find in UD Premier. Among the choices are Premier Duals Jersey (#/99), Premier Duals Premium Relics (#/15 or #/5), Premier Trios Jersey (#/75), Premier Trios Premium Relics (#/10 or #/5), Premier Quads Jersey (#/49 or #/25), and Premier Quads Premium Relics (#/10 or #/5). Finally, collectors can count on a brand staple with Premier Swatches, while Premier Gear (#/3) also returns. 2017-18-U.D. PREMIER ROOKIE VICTOR METE R.C. AUTO PATCH # 299 CANADIENS NICE! Overall odds: Tier 1 - 1:2.5 packs; Tier 2 - 1:25 packs, Tier 2 SP - 1:300 packs. Tier 1 individual group odds noted below. PARALLEL CARDS: Blue #/5 (Nolan,Nico #/25*). Overall odds: Base - 1:2 packs; Legends - 1:20; Rookie - 1:1.5 packs. 83 cards. Serial numbered #/3. PARALLEL CARDS: Gold #/15 (Hasek,Stamkos #/5*). 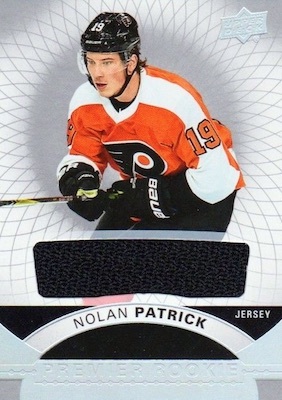 PARALLEL CARDS: Blue #/25 (Nolan,Nico #/10*). Overall odds - 1:3.5 packs. Overall odds - 1:5 packs. Overall odds - 1:40 packs. 60 cards. Serial numbered #/3. View the 2017-18 Upper Deck Premier Hockey checklist spreadsheet. Cracked 6 tins and did ok. Got a Clayton Keller Auto patch and a Brett Hull All Star Patch out of /5. Pricey in my opinion. Too many base/jersey cards for my liking. Wow !! Nice product !! Good job UD. Nice product but price doesn’t reflect the brutal rookie class. There is also a serious lack of high end veteran autos to compensate for it. Box is priced around $100 too much. Then again, UD has inflated everything and dropped quality universally since the exclusive rights, so no surprise. wholesalers still have this by the multycase load. they are hoping some rookie going to get hot soon to make demand for this..
same thing going to happen with Cup. In all honesty, considering what you can get from UD Premier, I would say it is worth the investment. Most places have this product going for around $149 or so, which is reasonable compared to the near $300 it was first introduced as. I cracked one box and had 3 out of the 7 cards have significant value that paid for the cost of the box. 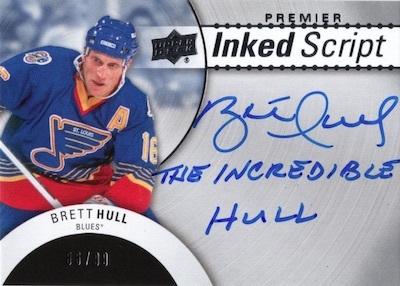 Premier has a great mix of hard signed autos and memorabilia pieces, so if you’re collecting for the thrill of adding to your personal collection, this product is for you! 2016-17 UD Premier Factory Sealed Hobby Box Auston Matthews RC ?